The Japan Aerospace Exploration Agency (JAXA) is working to confirm that its experiment to bomb the asteroid Ryugu was successful. 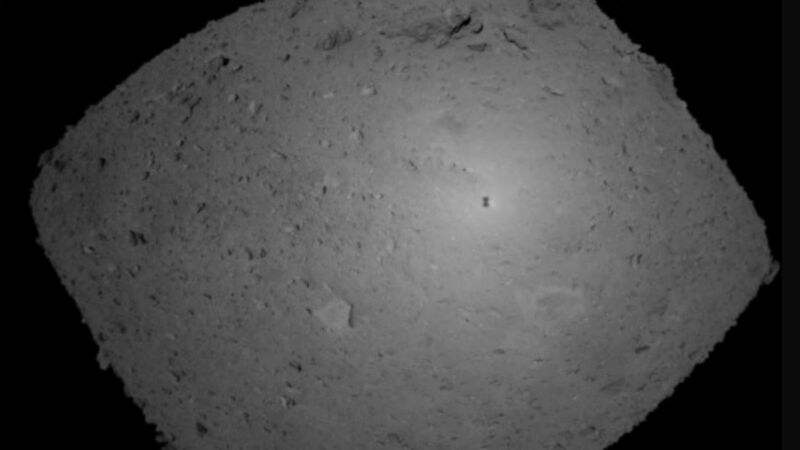 Today at 11:36 am Japan time, JAXA’s unmanned Hayabusa2 deep space probe deployed the SCI (Small Carry-on Impactor), which is designed to blow a hole in the surface of Ryugu to allow for deep sampling, but safety issues prevented the spacecraft from witnessing the detonation directly. Shooting explosives at an asteroid may seem like a great way to break the monotony of a dull afternoon, but it has a very serious purpose. Aside from pure science, the world’s space agencies are very interested in gaining as much information as possible about the structure and composition of asteroids because it may one day be necessary to deflect or destroy one that is on a collision course with Earth. JAXA has already made history with its 2003 Hayabusa mission, which returned the first sample from an asteroid in 2010. For Hayabusa2, the agency wants to up its game by not only making a more in-depth study using more sophisticated instruments, a lander, and a trio of hopping robotic rovers, but also by blowing a hole in the surface to get deeper samples that are uncontaminated by the regolith that coats the surface of Ryugu. To accomplish this, Hayabusa2 was equipped with the SCI, which is a space-going bazooka warhead. It consists of a shaped explosive charge formed into a cone with a 2-kg (4.4-lb) liner made of copper. When the SCI was fired at the surface, the charge was supposed to detonate and the copper turned into a molten slug that blasted open a crater in the asteroid, exposing buried material that has been protected from sunlight and damaging radiation for billions of years. The only snag was that being in the vicinity of the blast area is extremely dangerous, so after SCI was confirmed deployed by the probe’s Optical Navigation Camera-Wide (ONC-W1) instrument, Hayabusa2 was ordered to maneuver below the asteroid horizon before the SCI detonated. This meant that the spacecraft could not confirm the explosion. Instead, it returned to the predicted impact zone and is currently conducting a photographic survey. According to JAXA, preliminary images from the DCAM3 camera indicate that there was an ejection plume rising from Ryugu, which may have been due to SCI detonating. However, it might also have been caused by its impact on the surface, so the space agency is continuing to search and has promised updates as more information is available. If the SCI experiment was successful, Hayabusa2 will move in to extract samples from the new crater for return to Earth in 2020.